Zainuddin (second left) fields questions from the media at Sibu Airport. 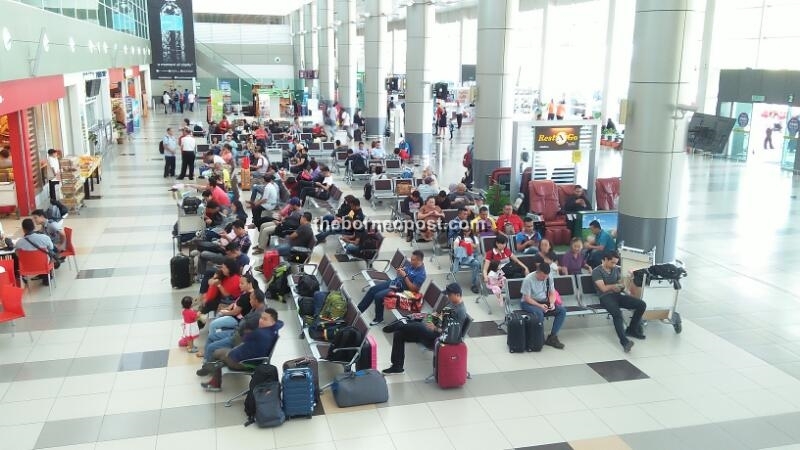 Passengers wait to embark on their flights as Sibu Airport resumes normal operation. Passengers checking flight information at Sibu Airport. The aircraft is removed from the runway by the salvage team. SIBU: A total of 1,413 passengers were affected by cancellations and delays of flights as Sibu Airport resumed operation today. From this figure, 782 passengers were inbound, while departures accounted for 631. The airport was closed to air traffic after Malaysia Airlines flight MH2718’s incident on Saturday night. 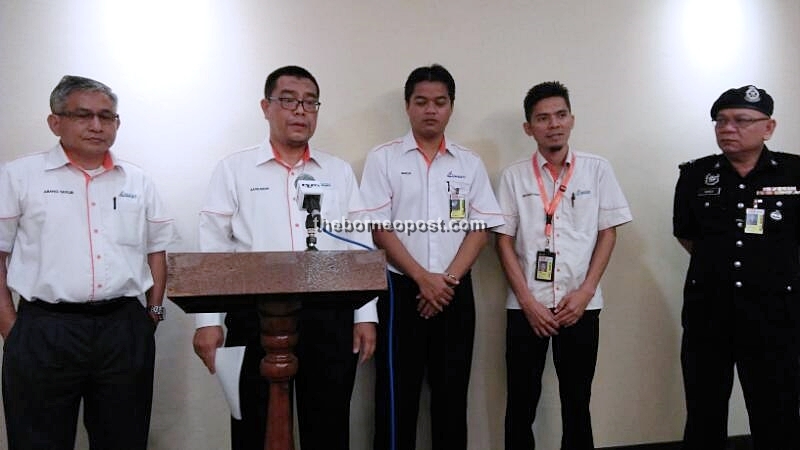 Malaysia Airports Sibu manager Zainuddin Abu Nasir revealed that there were 14 retimed and six cancelled flights from the 50 scheduled flights today. “The first aircraft to arrive in Sibu this morning is MH3401 from Miri, landing at 9.28am carrying 51 passengers. MH3401 is also the first aircraft to depart from Sibu to Kuching at 9.53am with 61 passengers,” he told a press conference at the airport here. For the record, Malaysia Airlines had two cancelled flights (Sibu/KL) while MASwings had four (Kch/Sibu/Btu and KK/Sibu/Miri). As for retimed flights, Malaysia Airlines had two (KL/Sibu/KL), MASwings also with two (Miri/Sibu/Kch) and AirAsia retimed 10 flights (Kch/Sibu/Kch, KL/Sibu/KL, Kch/Sibu/Kch, JB/Sibu/JB and KL/Sibu/KL). The airport was open at midnight today – 12 hours ahead of schedule after it was originally supposed to start operations only at noon, Zainuddin disclosed. The Malaysia Airlines Boeing 737-800 aircraft, which skidded after landing at the airport here on Saturday night had forced a total of 48 flights to be cancelled on Sunday – leaving 3,787 passengers stranded. Flight MH2718 was carrying 69 passengers, comprising 61 adults, two infants and a crew of six. All on board were Malaysians and there were no injuries reported. 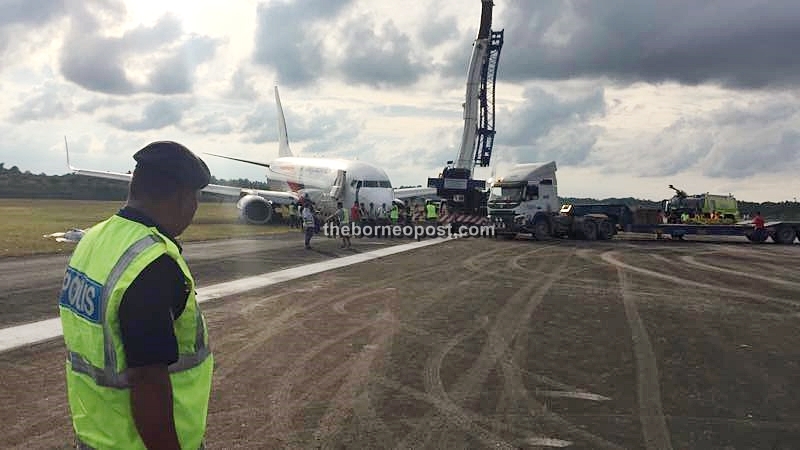 On the disabled aircraft, Zainuddin said the removal operation began at 5pm on Sunday and was completed at 7pm. He explained that there was no damage to the runway, which was intact and the grass strip which the plane scraped up after it skidded off the runway had been patched up. As for the cause of incident, he said this was still under investigation by the Aircraft Accident Investigation Bureau (BSKU) and that the Ministry of Transport will announce the findings in due course. Towards this end, he said all matters related to aircraft would be answered by Malaysia Airlines. He said their main concern is Malaysia Airports to ensure serviceability of all our facilities in the airport.